Paneer soda? It can be new to so many of you! I knew there is one such drink even when I was a kid, through my mom, drooling when she says paneer soda. Its not the paneer – Indian cottage cheese, but this is rose water – Panneer! It is used in Indian weddings by sprinkling over people to welcome guests. Also for mixing sandalwood powder and for puja purposes too. I so so love the fragrance of panneer. Be it in the rose ice (the triangle popsicles we get those days during summer) or any other sweets like jangri, I just go crazy about eating it. And this panneer soda is also not an exception! I had a chance to drink it only 2 years back near a temple (Ettukudi) and loved it a lot. So only once that time, after that I had no luck drinking panneer soda. Meanwhile here in SG, in pasta mania we get Italian lychee soda (litchi as we say), which will be more like panneer soda only that, this will be more sweet. So I thought of trying my own panneer soda at home. And thought it would be helpful for all panneer soda lovers to try on their own. Its so simple and easy just 4 ingredients, you have delicious thirst quencher for this summer! Bring water and sugar to boil, continue boiling in medium flame for 3 minutes. Cool down. Add rose essence and stir well. Once cooled down, you can store it in airtight bottles and refrigerate it. When ever needed, at the time of serving, add 3 tblsp or 4 tblsp over few ice cubes placed in a glass as per your sweet preference and add chilled plain soda over it and mix well. You can replace rose essence with rose water we get in stores. In that case, use 2-3 tblsp in place of 3 drops of essence, as rose water is slightly diluted. 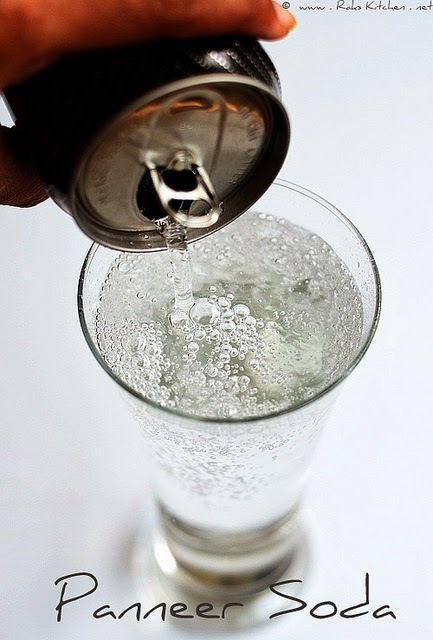 Another way for enjoying this drink – if you have rose syrup at home, you can use that as well along with soda. Use always good quality essence. Consume as soon as you add the soda to enjoy the great taste. Always serve chilled. delicious 🙂 i always go for lemon soda ! never tried this paneer soda ! have to search or try my own ! wow.. you've made nostalgia strike us all.. And the pics are simply superb.. Loved the first and last one with the refraction showing through.. science in clicking! Love panneer soda very much… Even now when I go to our kula theivam temple I used to drink this. after coming her switched to Lemon idea. Will try this now at home… Thank u so much Raji…. ohh i cn feel it..daily me n my son hv in the eve aftr visiting srirangam tmple..thnks i cn do it n chennai too..
First time I am posting a comment in food blog! Nostalgia strikes me..Thanks for this wonderful post!! this panneer soda is my H's fav drink…never knew that this can be made at home n its a very simple process…thanks for sharing..will try it sometime soon! This must be really yummy ! I remember it drinking in typical soda bottle with a goli during my childhood whenever i have been to my dad's village…Thank You So Much for this recipie…..
Goli paneer soda, wat a nostalgic post..Beautifully done. Have tasted it few times, though not a big fan of it…looks very refreshing! Thanks for the post.I tried it and it was the same as we use to drink in the petty shop. Will try this as soon as i go home today. Thanks once again for posting. I used to drink this in Madurai every time i used to go there for my summer hols. My periamma used to buy this for me. Thank you soo much for getting this back ! The recipe and the Photography makes me so thirsty !!!! Had the Goli Panneer soda and Rose Milk ( what is me with Rose essence ??!! ) in Mylapore !! The recipe and the Photography makes me thirsty !!! Had Goli Panneer soda during my last trip to Chennai ! !